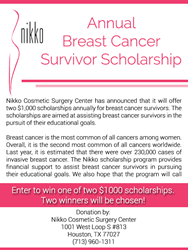 Nikko Cosmetic Surgery Center in Houston has announced the establishment of an annual scholarship program for the benefit of breast cancer survivors. Two scholarships, each in the amount of $1,000, will be awarded each year in the form of tuition assistance to assist the successful candidates as they pursue their educational goals. Nikko Cosmetic Surgery Center in Houston and its founder, Dr. Anthony Nikko, have announced a new scholarship program. Each year two scholarships in the amount of $1,000 will be awarded to breast cancer survivors. The awards will help to defray the cost of tuition at the educational institution (junior college, college, university, trade school or secondary school) chosen by the successful applicants. There are almost a quarter million cases of breast cancer diagnosed each year. The scholarship program is designed so that breast cancer survivors are better able to continue their education, and also to increase awareness of breast cancer and the importance of early detection. Interested parties should visit the Center’s website, where you can learn more about the program, as well as the online application process. Both current and former students are eligible to apply. The deadline for applications this year is September 30, 2016.